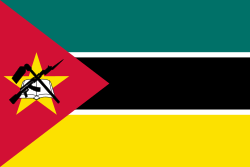 The flag of Mozambique was adopted on May 1, 1983. It has a horizontal tricolour of green, white-fimbriated black and yellow with the red isosceles triangle based on the hoist-side bearing the yellow five-pointed star that bears an AK-47 assault rifle with the bayonet attached to the barrel crossed by the hoe superimposed on an open book. This page was last changed on 25 February 2018, at 20:00.